Eve has broken her 4th commandment of clothing. How can this be? 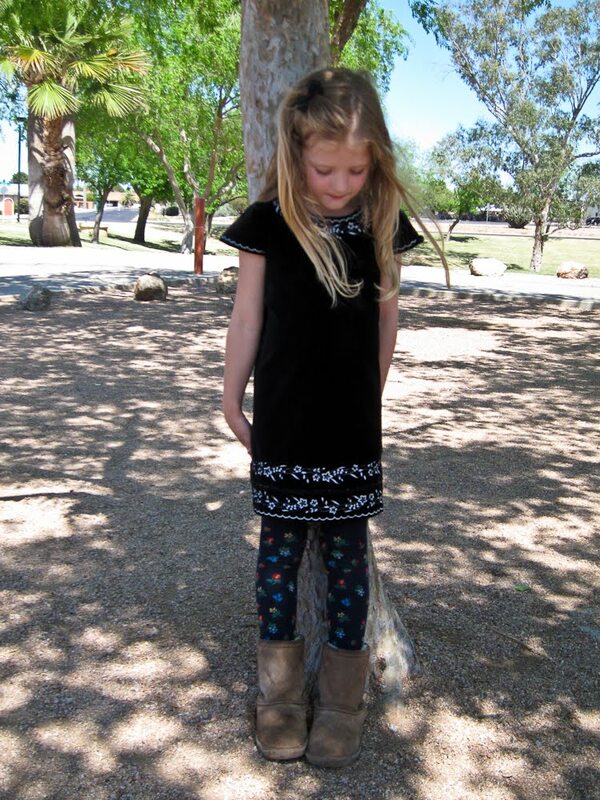 How does The Girl Who Will Not Be Constricted come to be at the park wearing a short velvet dress and tights? Luckily, I learned my lesson last time, and today I bit my tongue and gently offered her a chance to let me into her world. She is really into the book A Little Princess right now, and for her birthday recently I found her a copy of the PBS miniseries based on that novel that I loved so much when I was her age. Contrary to what you might expect, she is much more drawn to the Sara Crewe who has lost her fortune and spends her days as a maid of all work, living in a boarding school garret in London, than the resplendent Sara who has everything she ever wanted and a wardrobe to die for. Miss Minchin, the cruel headmistress, makes Sara wear an old black frock that is too small as she works off her debts after her father dies and leaves her with nothing. She wears black tights because, well, she lives in London and it is cold there, and Eve felt that while the book did not mention sheepskin boots, they were the footwear she had that were most in keeping with the spirit of downtrodden Victorian former elegance she wanted to embody. ...I must be the evil headmistress. To Eve, and her spirit! Way to have a good attitude about being the evil headmistress. Oh man, I love Eve. Like, really, really love her. She is so great at being a kid. Is it horrible that I think you should take this opportunity to give her some extra chores? If she wants to be a little maid I'd let her! Uh, you're not bad. That would be a wasted opportunity, and we don't like to waste free labor! Somehow, I can TOTALLY see my Maggie doing this when she's Eves age. Dramatical and imaginary conversations = awesome. I used to fill up a glass of grape juice (as "medicine") and sing "Spoonful of Sugar" as I drank it by spoonfuls.